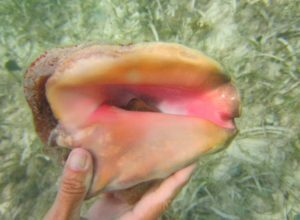 The following account was written by Evolve alumni Wade Wilson and outlines his trip to the Cayman Islands. We welcome all alumni to contribute to the blog content! 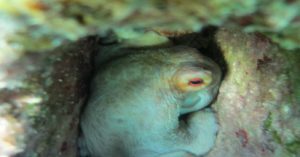 I recently visited Grand Cayman. 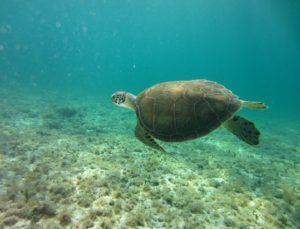 I had heard about the scuba diving there so I went on two tank dives but found the snorkeling to be much more enjoyable. So I decided to take a few minutes and highlight some of the places we visited. But before I get started, let me acknowledge that attending the Evolve Freediving class greatly improved my abilities. I was finally able to equalize-thanks to Ashley-and so I was easily diving to 40 or so feet without any pain. (easily may be a stretch, but I think you understand what I mean) And no more nosebleeds! The stingrays were a main attraction at Lighthouse Point. This was by far my favorite. Just you and the ocean. This place is just beautiful, as there is no beach, only rocks, and very few people. Dive Tech is the scuba shop there, where most divers just walk down to the dock and jump in. There is also a café and a nice restaurant on the top floor of the building. Following the lead of the other divers there we also walked down to the dock and just jumped in. It was absolutely beautiful! 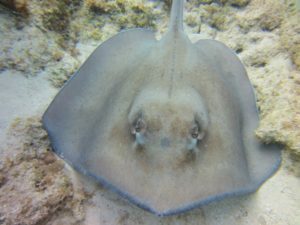 We saw several small yellow stingrays and were able to dive down to around 40 feet and check them out. We also saw flounders and of course plenty of fish. The scenery was fantastic and truly an enjoyable swim that presented many opportunities to practice equalizing and breathholding. After a couple of hours, I also enjoyed a cold beer(s) at the café. Light House Point is in West End near the turtle farm. The area was also called Turtle Reef, but we didn’t see any turtles there. Odd, as we saw them about everywhere else. The turtles were numerous at Eden’s Rock. This place was great! The dive shop was called Eden Rock Dive Center. Andrew was so helpful and welcoming, so if you go be sure and meet him. Again no beach, and the cruise ships are within swimming distance. Just jump off the dock and there you go! 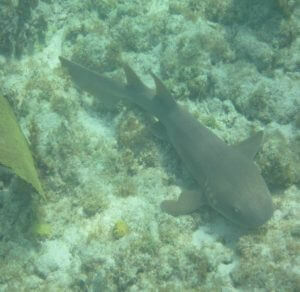 The reefs there were amazing and so was the wildlife. We saw many tarpon, probably 4-5 feet in length. There were stingrays, both yellow and southern Atlantic, and turtles. The reef had several swim throughs, but I never attempted any. 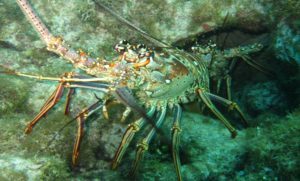 You could dive to a little over 40 feet, get a good look at the tarpon, or look for lobster and head back up. A beautiful spot. After several hours, we called it a day and I was exhausted. This is the beach where we stayed. To be accurate, we were next to the Marriott. If you go during the day there are so many people and activities and boats that it’s difficult to see all there is. We learned to go at 6:00 am and it was fabulous! We were all alone in the ocean as far as people go, but so much wildlife. 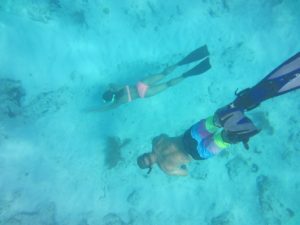 We spent time with stingrays, both Atlantic and yellow, as well as lobsters, turtles, lionfish, eels, and even nurse sharks. I never get tired to shark watching. The reefs were nice and the water was smooth. We were probably in 15-25 feet of water at the deepest, so it was a lot of fun to go down and see what was going on. We even went snorkeling at 10:00 pm. This started out great, seeing lobsters crawling on the bottom, stingrays searching for food, and octopus trying to get a meal. However, the sea wasps had come in. These are related to the box jelly fish which we found out by looking at Google. The sting is like a yellow jacket, so after my third sting I had enough and got out. If you choose to go at night, be sure and wear a wetsuit to protect you, and pay attention to the moon. I believe a full moon draws them out. It was worth it, but difficult to overcome the fear of being stung. I suggest you go early in the morning, like we did. Animals everywhere, and after a couple hours you can have a cup of coffee and breakfast. nice barracuda (I think). There were a lot of fish around the dock so hang out there. I heard a rumor that this was the birthplace of the Mudslide, so definitely try one of those. I know most people reading this are freedivers, and can go to greater depths with ease. But you also understand how much the class with Evolve helped me. My goal was to enjoy snorkeling more and I certainly accomplished that. Thanks to Ashley, I was able to equalize and get much deeper comfortably, even though I will be in trouble with her at my next class because I haven’t perfected the Frenzel method yet. Going to 40 or so feet comfortably and hanging out for a few more seconds was certainly worth the time I spent in the class. Also, I was able to encourage my daughters to do the same and that was absolutely worth doing. Sharing something amazing with the family is what it’s all about.